A couple of cool items this morning. First is that Promise of Blood was voted by the fans of SFF World (a reasonably large online fantasy community) as their fourth favorite book of 2013, behind big names Mark Lawrence, Scott Lynch, and Robert Jordan/Brandon Sanderson. Pretty dang cool. Thanks to all the fans who voted, and congratulations to all the other names on the top ten list. Truly some fantastic writers and I'm a little baffled that I've been listed with them. The second piece of news is that the short lists for the David Gemmell Awards for Fantasy were announced. Promise of Blood finds itself not on one, but two of the three short lists. The Ravenheart Award for Best Cover Art, for the cover by Gene Mollica and Michael Frost. And the Morningstar Award for Best Debut Novel. Congratulations to all the other nominees. Certainly some stiff competition on those lists. The final winners will be announced on June 13th. VOTING ON THE SHORT LIST FOR THE GEMMELLS IS NOW OPEN. Hey folks! Every year, the David Gemmell Legend Awards are handed out to heroic, epic, and high fantasy novels that came out the previous year. Here's the big deal: these awards are voted on by the public without need of registration (like Goodreads) or a paid membership (like the Hugos or Nebulas). 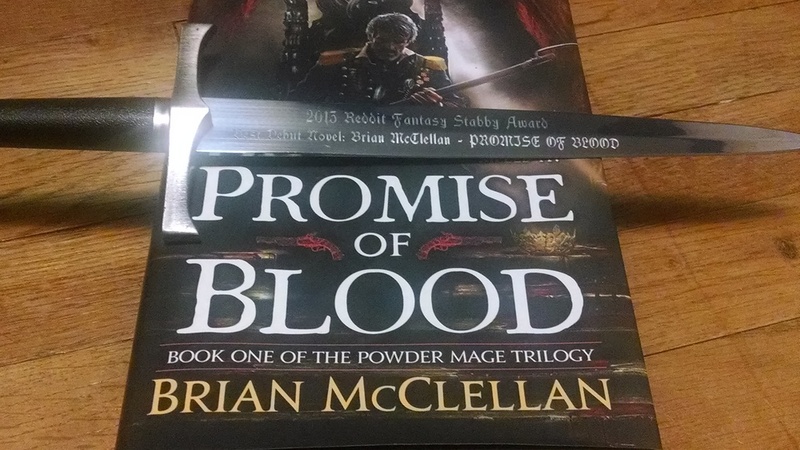 Promise of Blood is eligible for all three Gemmell Awards. Right now the voting is in the "long list" stage, so we're just trying to get past the first of two rounds. The Morningstar Award for Best Newcomer/Debut. The Legend Award for Best Novel. The Ravenheart Award for Best Fantasy Book Jacket/Artist. If you read at least one fantasy novel last year that you've enjoyed, please go to the links above and vote! I went away for a convention this weekend and when I returned, there was an /r/fantasy Stabby Award waiting for me! How cool is that? Thanks /r/fantasy (and a special thanks to /u/elquesogrande)! Sorry for the glare. I'm terrible at photography. Not only that, but I'm in my first year of eligibility for the John W. Campbell Award for Best New Writer. This is the big one for new authors and frankly the Hugo is a little out of my league (so is the Campbell, but that doesn't stop me from reaching for it). The Campbell Award voting is done in conjunction with the Hugo Award, so don't forget that one when you're filling out your Hugo Ballot. In order to nominate for the Hugo, you have to have been a member of the 2013 Worldcon (LoneStarCon, or be a member of the 2014 Worldcon (LonCon). Here is a link that will tell you everything you need to know about nominating. In order to nominate for the Nebula Award, you have to be an active SFWA member. More info on that here.